Floods and river floods are among the most destructive natural disasters, resulting in many loss of life, infrastructure damage and economic hardship. Companies are now increasingly threatened by such floods, mainly because of the increasing exposure of goods and people in risk areas, but also because climate change is expected to change the magnitude, frequency and seasonality of floods. An accurate assessment of the flood hazard is therefore crucial for the sustainable development of societies. In the absence of long hydrological measurements, traces of past events collected in the field provide a unique insight into truly extreme events and their variability in space and time. This approach has been developed from various historical, botanical and geological records over the last decades. An overview of these different archives is the subject of this article, with a particular focus on (i) past flood recording mechanisms for each type of archive, (ii) the development of methodological approaches and (iii) the type of information that these archives can provide. These studies provide several hundred series of historical floods and paleo whose analysis reveals a notable dominance of recordings in Europe. After describing the diversity of flood information provided by this dataset, we identify how these recordings have improved and could further improve flood risk assessments and, as a result, management and mitigation plans. flooding. 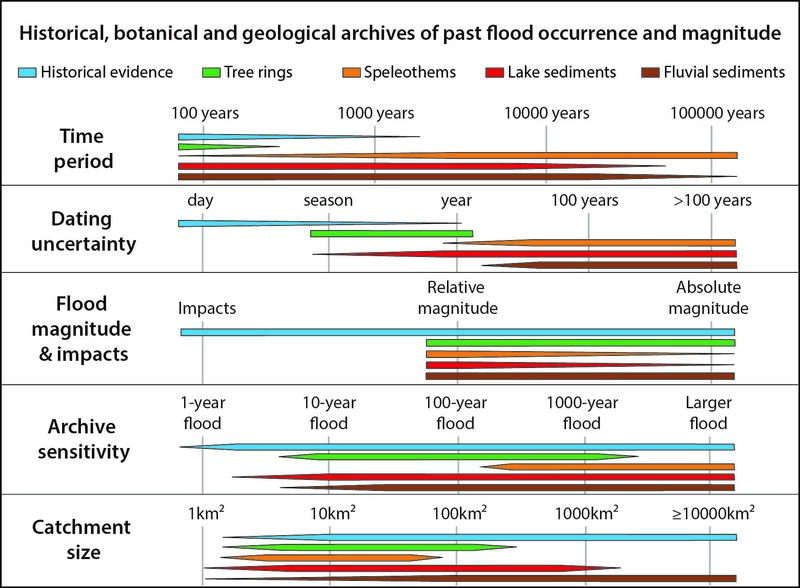 This summary article is the result of the PAGES Floods working group, which brings together around a hundred researchers from all over the world, all of whom focus on documenting and analyzing past floods. The activities of this group, which resulted from this article, were launched during the "Cross-Community workshop on past flood variability" which took place in Grenoble from June 27 to 30, 2016, and which was financially supported by PAGES, the OSUG @ 2020 Labex (Investments for the future - ANR10 LABX56), the European Geosciences Union, Grenoble-INP and the Université Grenoble Alpes.